The Daily Audrey: A Treat For Your Little Girl's Feet! These shoes are super comfy and ideal for your young ones! They come with removable straps and are foldable - just like their big girl counterpart Suelas! Audrey really loves them and her pink glittery pair holds a special place in her heart :) She just wants to wear them all the time! 4. 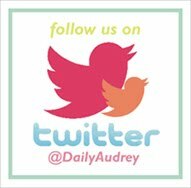 TWEET US @DailyAudrey @suelasonline with "A Treat For Your Little Girl's Feet! #AudreyForSuelitas"